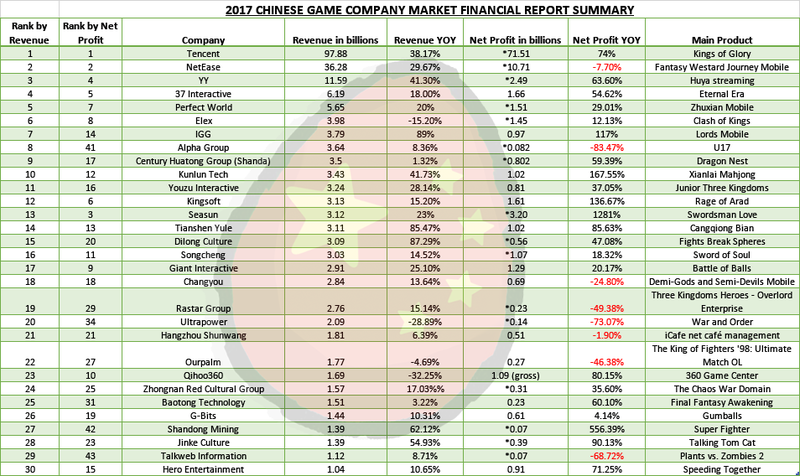 At the end of March, dozens of publicly traded game companies including Tencent and NetEase disclosed their 2017 financial statements (or performance forecasts). Recently, people from Youxi Putao collected the information for 50 companies that had disclosed reports and ranked them by net profit. Companies that did not disclose net profit specifically for their game business have been replaced by net profit for their group, marked with a *. The table below ranks the top 30 by revenue, but includes their net profit ranking. In total, 38 companies achieved a net profit of 100 million yuan, and another 9 companies doubled their net profits this past year. Tencent and NetEase still firmly occupy the upper echelons of the gaming industry with net profits reaching 10 billion. Ranks 3-13 constitute a secondary echelon where net profit is more than 1 billion. 37, Perfect World, Kingsoft, Giant Interactive, and Seasun are established companies in this area and have remained strong. Some companies that provide live streaming platforms, such as YY and Songcheng, also maintained a steady increase in profits. Most companies in the third echelon of 1-10 billion in net profit started in mobile game production and have risen rapidly over the past two years. However, 30% of the companies in this third tier have experienced a decline in net profits, and the further down in the rankings you go, the more drastic the decline (Shenzhen Hifuture and Fuchun Technology, ranks 49 and 50, saw declines of over 250%). In terms of large manufacturers, Tencent’s annual online game revenue was 97.883 billion yuan, and NetEase’s was 36.282 billion yuan. Together, they had a share of more than 133 billion yuan. As in previous years, the oligopolistic effect these two companies have on the industry continues to be a persistent topic of conversation. The report shows that Tencent and NetEase have sustained their fast paced production throughout 2017, widening the gap between them and other companies to some extent. Tencent has Dragon Nest, Demi-Gods and Semi-Devils, QQ Speed, and other games organized under their banner, allowing them to launch a new main product every quarter. NetEase put more effort into categories outside of MMORPGs and launched products like Juezhan: Pinganjing (a MOBA), Knives Out (battle royale), Terminator 2: Judgment Day (adventure shooting), and Eternal Capital of the 7th (urban fantasy RPG), among others. Large manufactures are constantly making efforts to create more products, giving them considerable user traffic. The situation for small and medium-sized companies is therefore difficult. Comparing the financial reports for several companies with a drop in net profits, common complaints included “delay in launch of key products” and “some game items did not meet expectations”. The lack of diversified products makes it difficult for traffic acquisition, resulting in a decline of net profit. Additionally, some manufacturers are relying on their older products, which may now have reached a point of slower growth. New products can’t assume the responsibility of being a main product so quickly, which is one reason for a decline in profit and revenue. Among the 50 companies included in the report, some companies gained success through mergers and acquisitions. Among them, Kunlun Tech acquired Xianlai Entertainment this year, resulting in a net profit increase of 167.55%. Xunyou Technology, focused primarily on online gaming speed accelerators, acquired LionMobi, resulting in a net profit increase of 164.35%. Traditional mining company Shandong Mining began the process of acquiring Linyou Interactive, and saw a 556.39% net profit increase. This past year, EGLS acquired both Muzhiwan Technology and Hangzhou Sooying, and its net profits doubled. Shandong Mining is one example of a traditional company acquiring a game company, but there were many cases of this in 2017. Shandong Mining’s main business is the production and sale of coal machinery, and in 2015 they had a net loss of 268 million yuan. In just the first three months of 2016, they had a net loss of 35 million yuan. They decided to acquire Linyou Interactive, and saw a net profit increase of 556.39%. The acquiring of a game company helped rejuvenate the “sunset” company. Mergers and acquisitions of game companies has become one of the most important ways for traditional industries to transform. We can see from IGG and and MicroFUN that there is no shortage of companies that can rely on a single product to maintain the entire company’s revenue. MicroFUN pointed out that 99.67% of their 2016 revenue came from their game Bingo Crush. Lords Mobile generated 438 million USD in a single year, accounting for 72% of IGG’s overall revenue, with IGG’s COO stating that it’s still far from hitting the ceiling. Most companies, however, are beginning to realize that it’s unrealistic to rely on a single product to maintain long-term growth. Therefore, a primary goal for these companies in 2018 is to explore the next growth point. For example, Dianhun’s primary game, Dream Three Kingdoms (a PC game), has been a stable source of revenue, but they’ve announced that they’ll be increasing mobile product development and operational efforts to tap new growth from the mobile games market. Original article from Youxi Putao, translated for Youxi Story with additional information by Johanna Armstrong.